In September, 2014, Vortex MT successfully designed a new powder mixer flavoring line for a coffee manufacturer in Saudi Arabia. The flavoring line would more efficiently add various flavorings to the coffee. 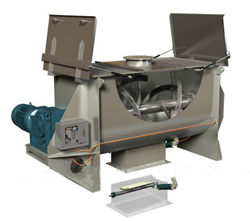 Two common types are ribbon blender and paddle mixers. Each consists of a stationary U-shaped trough (or tank) equipped with a rotating agitator shaft. AL Khair Co. Ltd., Jeddah, Saudi Arabia is a commercial coffee roaster that produces more than 50 million kg of roasted whole bean and ground coffee per year. In 2013, after commissioning a new state-of-the-art production facility, the company decided to improve its flavored coffee production process to increase capacity and reduce operating costs. To accomplish this, the company needed to design a new powder mixer flavoring line that would more efficiently add the various flavorings to the coffee. In the past, the company used two intermediate bulk container (IBC) tumbler stations and two ribbon blender to add flavoring to whole coffee beans. For small production runs, the company used the two tumbler stations. Using a floor jack with a weigh scale, an operator moved an empty IBC to a dispensing bin and gravity discharged 500 pounds of coffee beans into it. The operator then moved the filled IBC to a tumbler station and poured the proper amount of liquid flavoring into the IBC. Next, the operator sealed the IBC and placed it into the tumbler station, which rotated and tumbled it for 30 minutes to fully coat the beans with the flavoring. Finally, the operator moved the IBC to a staging area where it sat for at least 8 hours to ensure full flavor absorption. For large production runs, the company used the two tumbler stations and the two ribbon mixer. As with the tumbler stations, an operator filled 500 pounds of coffee beans into a ribbon blender, poured the liquid flavoring in, and started the blender. The flavored coffee beans discharged into a portable bin that was moved to the staging area for at least 8 hours. From the staging area, IBC’s containing beans to be sold as wholebean coffee were routed to the packaging line. IBC’s and bins containing beans to be sold as ground coffee were moved to the facility’s two grinders, which ground the flavored beans. The freshly ground coffee discharged into 2,000 pound capacity mobile tanks, which an operator moved by forklift to the packaging line. Using just the two tumbler stations, the company was able to flavor 2,000 pounds of coffee per hour. Adding the ribbon blenders to the process doubled the capacity. Shortly after starting operations in the new production facility, the company began focusing on improving and expanding the flavored coffee product lines. While visiting regional trade shows, Adnan had seen a batch mixer with a rotating drum that would spray a liquid directly onto a dry material, ensuring a uniform distribution of the liquid throughout the batch. To gather more information about the mixer and how it might be used to upgrade the flavored coffee process, Adnan contacted Jim O’Brien, a regional manufacturers’ rep the company had worked with before. O’Brien is a partner at Solids Tech LLC, Riverside,Calif., which reps for various equipment manufacturers that supply systems and equipment to the food, pharmaceutical, chemical, nutraceutical, and mining industries. SolidsTech represents the manufacturer of the batch mixer Adnan was interested in Vortex Mixing Technology Co., Ltd, Henan, China., a supplier of a wide range of mixing, blending, and size reduction equipment. The model 700VMT50SS Rotary Batch Mixer consists of a horizontal stainless steel mixing drum that rotates on two heavy duty trunnion rings. The drum has a stationary inlet at one end with a self adjusting face seal for dust free operation and a stationary outlet at the other end with a steel reinforced urethane disc discharge gate. A variable speed 5 horsepower TEFC motor powers the 50 cubic foot working capacity batch mixer, which can handle materials with bulk densities up to 65lb/ft3. The mixer is approximately 128 inches long, 79 inches wide, and 79 inches tall, and, depending on the bulk density, can hold up to 3,600 pounds of material. Gaviña installed a liquid spray system in the mixer consisting of four spray lines, each of which is attached to a rigid internal spray bar that runs about two thirds the length of the drum and has several spray nozzles. Each spray line is connected to a liquid flavoring container with a pump. During operation, the mixing drum rotates clockwise, with the batch positioned slightly off center in the drum’s bottom. (If the rotating drum were branded with a clock face, the batch would mix between 4 and 9.) The spray system’s nozzle heads are positioned at an angle so that the liquid flavoring is sprayed directly onto the moving material only, not the drum walls, where it would cause the material to cling, forming balls and lumps and diminishing cleanout efficiency and product quality. The company built a mezzanine in the center of the facility and installed the mixer on the second floor. To flavor the ground coffee, an operator accesses a PLC control panel and activates the pneumatic conveying system to transfer ground coffee from the degassing tanks to a receiver bin located above the mixer’s inlet.When prompted, the ground coffee discharges to a batch weigh scale, which weighs the coffee and discharges up to 1,100 pounds into the mixer. The operator then accesses the mixer’s controller and starts up the mixer and spray system. The operator also prompts the receiver bin to reload the weigh scale to stage the next batch. When mixing, the mixing drum’s continuously welded internal lifters and baffles lift, fold, and gently tumble the coffee onto itself. The spray system operates throughout the mixing cycle, ensuring that all particles in the mixing zone are uniformly coated. At the end of the mixing cycle, the mixer’s discharge gate opens and the flavored coffee fully discharges into a batch tank, from which it’s pneumatically conveyed to a set of holding tanks before being pneumatically transferred to the packaging line.